Principal Cast : Claude Rains, Gloria Stuart, William Harrigan, Henry Travers, Una O’Connor, Forrester Harvey, Dudley Digges, EE Clive. I would imagine that early 1930’s audiences who witnessed the visual effects of James Whale’s The Invisible Man would have been astounded. 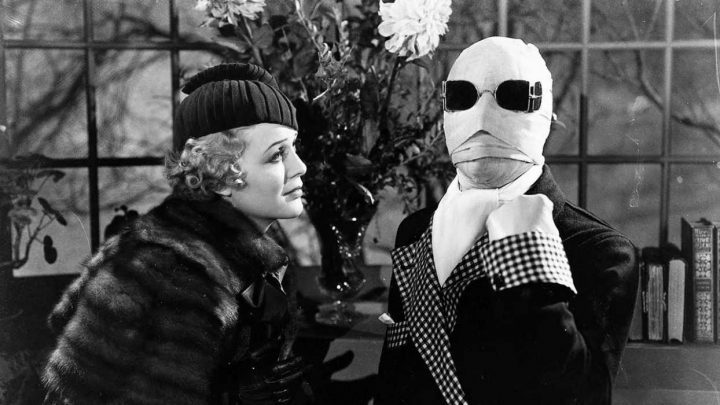 After all, the concept of an invisible man, let alone the cinematic depiction of one, is among the highest flights of fancy for the fantastic and extraordinary; who among us hasn’t had “being invisible” at or near the top of a list of superpowers we’d love to have were it possible? HG Wells’ cautionary tale of a doctor driven insane by being invisible (and not being able to turn back again) has been produced numerous times throughout Hollywood’s history, but perhaps none more startling than the Claude Rains-starring version that started it all. Rains stars as Jack Griffin, a scientist who has discovered the secret of invisibility. 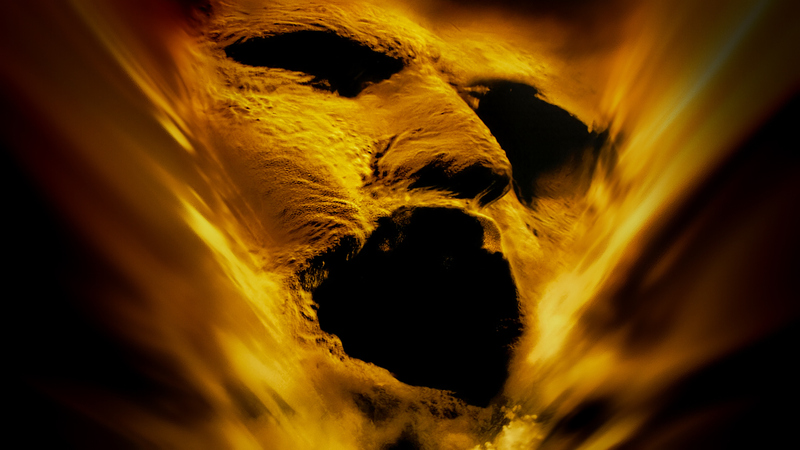 After he tests it upon himself, he discovers he can no longer turn back to being visible again, an accident that drives him insane. Desiring power, Griffin sets out on a murderous rampage, assisted unwillingly by Dr Arthur Kemp (William Harrigan), while his employer Dr Cranley (Henry Travers) seeks to help the crazed man. Griffin’s insanity fails to sway his love, Cranley’s daughter Flora (Gloria Stuart) from continuing to pine for him, even in the depths of his lunacy. As the police close in, Griffin causes havoc since people cannot see him – he escapes police after killing one, derails a passenger train into a chasm, commits violent and criminal acts, sending the country into a panic. It struck me as I watched The Invisible Man that it’s a lot like watching the pre-animated sequences of Who Framed Roger Rabbit: there’s lots and lots of scenes in which an invisible Dr Griffin manipulates the environment around him, moving objects and things that appear to defy the laws of physics, and while I did titter a few times at the anachronistic filmmaking on display, Whale’s fast-paced and inventive direction is admirably ahead of its time. Doors and windows mysteriously open, cars self-drive, levers inexplicably pull, hats flip and footprints appear in the snow: the film is a stylistic delight that never ceases to amaze considering the period of its production. Of particular note is the “invisibility” of Griffin occurring in-camera, having a live human actor appear to disappear within the film’s frame in a manner we typically associate with green screen technology – think of Harry Potter’s invisibility cloak, which is basically the exact same thing – and while it might look clumsy by today’s modern standards, audiences must have freaked out when they saw it in 1933. Rains, who would later appear in films like Mr Smith Goes To Washington, Casablanca and Lawrence Of Arabia, makes his American screen debut here as Griffin, although for the majority of the film he’s either a disembodied voice or completely covered in clothing and bandages to obscure his face. Rains’ melodramatic vocals and simmering rage give him a potency only aided by the costuming and creepy invisibility effects, and while it’s hard to attach to him simply because we can’t see him, he achieves the desired affect of making himself a presence in the film that could literally come from nowhere and cause disaster. 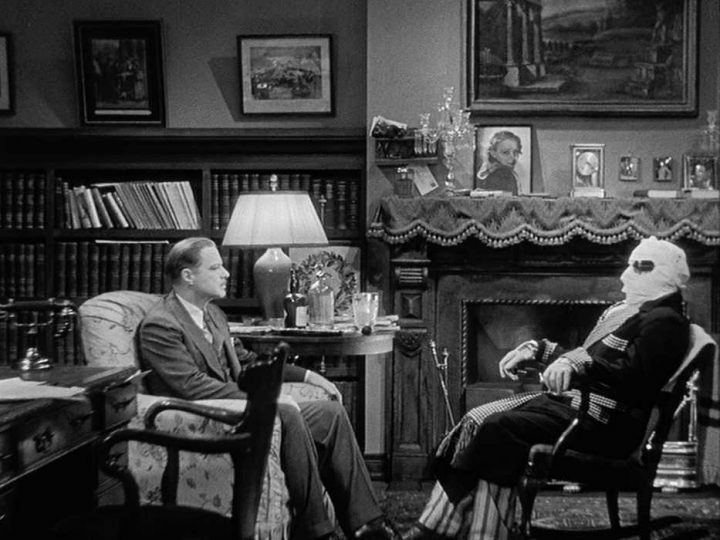 Co-stars Willian Harrigan and Henry Travers offer a modicum of complexity in their roles within the story, providing Griffin a with a contrast for his evil nature, while poor Gloria Stuart – yes, the same Gloria Stuart who threw the blue jewel into the ocean in James Cameron’s Titanic – is forced to deliver some risible dialogue and prototypical sexist character beats as Griffin’s love interest, and as beautiful as she is, she cannot salvage what is the weakest element of the script. In what I found to be a pleasant surprise, Whale’s film starts almost mid-story, with Griffin already invisible and desperately seeking a cure for his inadvertent chemical discovery. No set-up, just bang into the story! A large portion of the film’s first act occurs inside a small-town inn, run by Herbert and Jenny Hall (Forrester Harvey and Una O’Connor respectively), which plays like a bizarre farce until things take a serious and deadly turn. It’s always a good thing to have Una O’Connor in a film, and much like her turns in Hitchcock’s Murder! and Oscar-winning Cavalcade, she’s a screen dynamo, offering brash comedic wit and physical humour that works brilliantly. 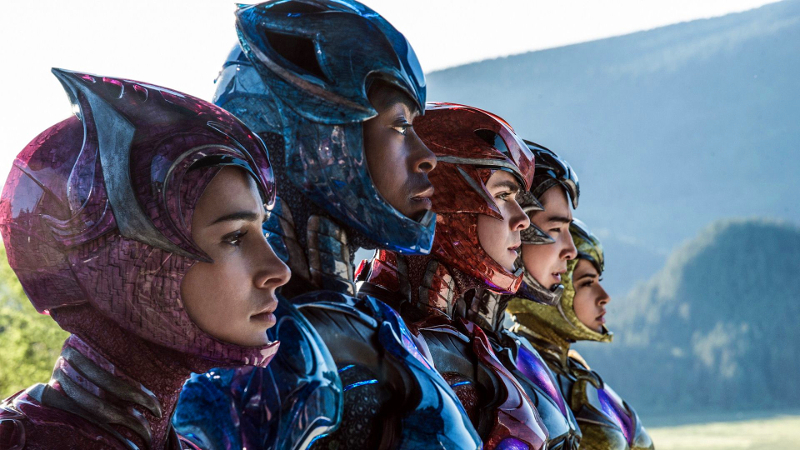 Because the film leaps into the narrative mid-stream, I was caught off-guard a little in expectations (which is great, let’s face it) and as the story unspooled and revelations were… er, revealed, the film’s pace and emotional resonance kicks in. Also surprising is the use of the camera to tell the story in such an exciting manner. Rather than remain aloof and distant, Whale’s camerawork is thunderous and intuitive, moving and panning and dipping to capture the energy of the story through every scene. From the calamitous train wreck (which is quite spectacular), to a car-over-a-cliff sequence (again, rather gripping for its ferocity) and the jaw-dropping effect of having Claude Rains unwrap his bandaged head to reveal an actual invisible head, there are moments in this movie that belie the period in which it was made. The film’s sense of humour does jar a tad against Griffin’s violent tendencies, the slapstick police force assembled to capture the criminal scientist being particularly Keystone-Kops-y, but overall the sense of menace and horrific actions in play here are competently delivered by a director unafraid to throw his camera into the fray. 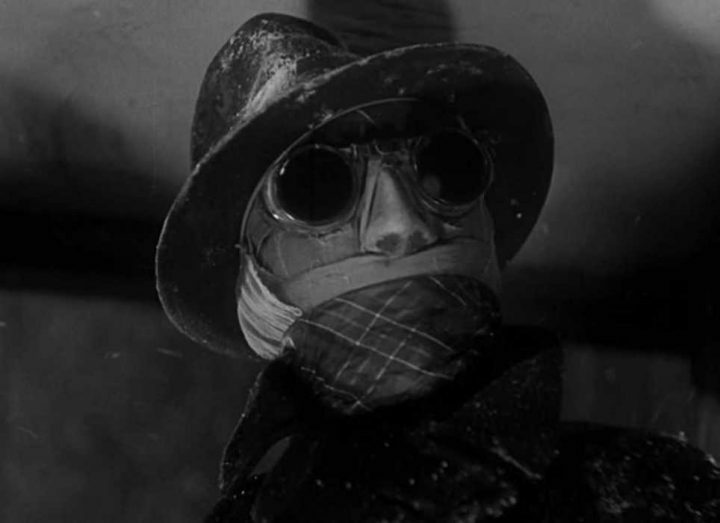 The Invisible Man might feel a bit stodgy and clunky compared to modern effect-driven escapades (Paul Verhoeven’s Hollow Man, which borrows liberally from this movie, comes to mind immediately) but the technical virtuosity and narrative insidiousness cannot be overstated. The film boasts some momentous effects and set-pieces and has the tragic tale of a man driven by hubris into insanity, making him a “monster” less like Dracula or Wolfman and more human than we often like to consider. 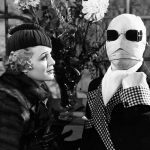 The Invisible Man is rightly considered a classic, and despite some minor misgivings about the “romantic” angle of the latter stages, or the weird humour-and-violence tone that develops occasionally, it’s eminently entertaining even today.